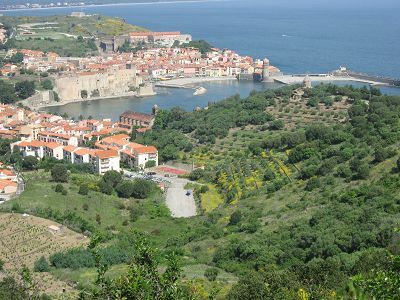 This is an energetic first part climb to the ridge between Port Vendres and Collioure for a spectacular view followed by drop down into Collioure and back along the Corniche road. It is well worth the physical demands. Start at the Market Square (Place de l’Obelisque). Turn out of the square by facing with one’s back to the harbour, turn right on to Avenue Vauban down to the harbour edge and right again past the pair of heroic canons, (surely these could tell some stories). Follow the quay side out to Quai Pierre Forgas and walk its whole length to the opposite end of the marina, past the Tourist Office, turning towards the left but keeping the end wall on the right. At the small roundabout under the high wall, take the steps up to the Place Castellan and walk straight across this formal area to the small road opposite, rue des Paquebots where some charming old steps lead up to the bottom of the Route Strategique. Turn right. Already views back over Port Vendres, the harbour and beyond can be enjoyed. The route strategique is a quiet road and a slow climb behind the residences of Port Vendres to a hairpin bend to the left and beyond. After a second major bend to the right it opens on to a wonderful view of the vineyards carpeting all sides of the valley with the route national 114 way below and the mountains extending up to Tour de Madeloc. Different seasons hold the secret of the colours this view may take – brown in winter, lemon green in Spring, emerald in summer and with the advent autumn every imaginable yellow, orange, red and brown radiate as far as the eye can see in a spectacle of patch work brilliance. Proceeding steadily up this open country road, Fort St Elme, now a private home (and on certain days, open to the public) but previously having been part of the coastal defences, stands proudly and directly in front and is the challenge to reach. Once at the top and slightly beyond, there is a vantage point to appreciate the panoramic views with spectacular scenery in all directions: behind the valley leading into Port Vendres, Tour de Madeloc, Tour de Massane, Les Alberes, Pic Canigou, the plain of Roussillon, the Corbieres in the distance, the coastal towns of Argeles, St. Cyprien and beyond and immediately below, Collioure in its entirety. Facing Collioure by the vantage point, a yellow flash can be seen painted on a rock and by following this indicator, a rocky path drops down the side of the ridge. Care needs to be taken but it is safe and a well trodden route. Take note, not to go by any paths indicated with a yellow ‘X’. The path down steadily traverses the hill towards the right and very soon is skirting a newly reclaimed and planted vineyard. 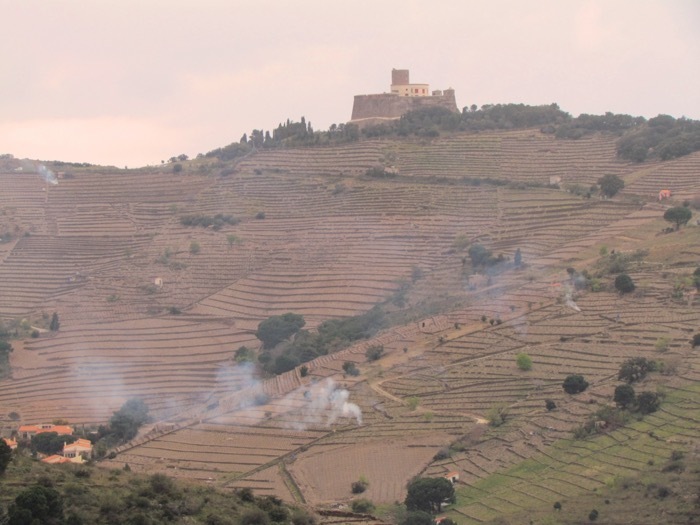 This in turn, gives way to the reclaimed olive grove of Collioure, where proudly stands the faithfully restored and renovated windmill, a relic well worth visiting when open some afternoons of the week. It is possible to buy olive oil from this grove when the mill is open. Steer to the left of the moulin de vent and follow the well constructed steps and path down through the olive trees and at the bottom of the hill a charming building appears on the right set in its own period styled garden. 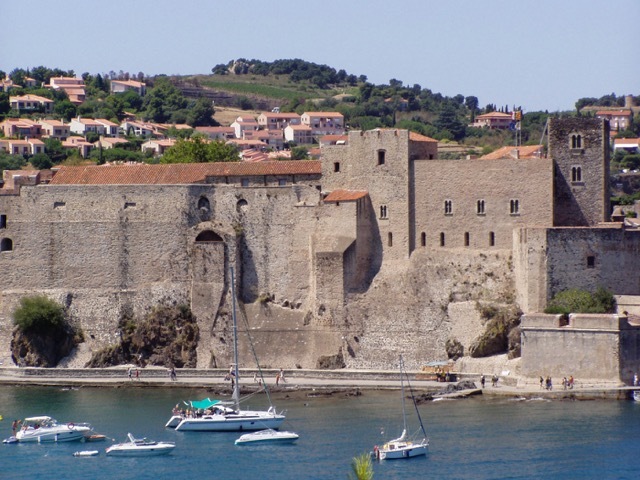 This is the Musee d’Art Moderne of Collioure, where exceptional art exhibitions are put on and a permanent collection well rewards the elegant gallery in which it is housed. 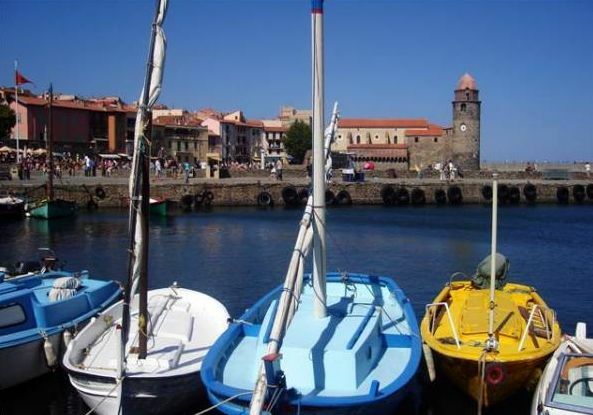 It is well worth stopping and viewing this jewel of Collioure. Leaving the Musee on the right, take the path out of the grounds and turn right into a small alley where soon another Collioure art form is apparent for the old church on the left is now entirely given over to the production of wine by the Cooperative de la Dominicain. Tasting and purchasing are encouraged here. 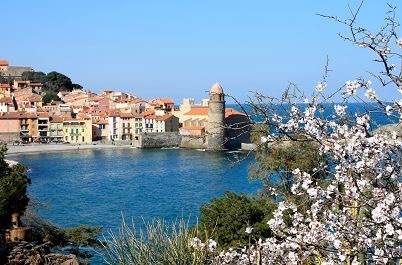 To describe Collioure is beyond the remit of this narrative but time must be spent here to explore its famous charm that attracted the creation of the Fauvist movement by Matisse, Dufy, Derain and others a hundred years ago: even Picasso came and painted here for a short while. 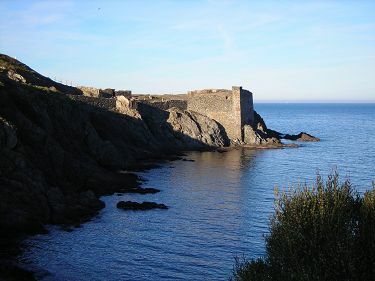 It is advised that the return journey starts at the Port d’Avall beach, which is reached by continuing from the church cooperative building to the bridge and then crossing to the other side of the road and taking the jetty off to the right, leaving the beach on the left. The jetty projects beyond the small headland pointing to the dramatic Chateau Royal and around the corner, passed the scuba diving club, the rocky coast is followed for a few hundred metres before climbing up cliff steps to the coastal road. Turn left on to the very well made pavement and continue along the winding Corniche footpath which again offers spectacular views along the coast. As Port Vendres is reached, pass the new Lidl store and under the bridge to the junction by the Dome art gallery, (home of a permanent exhibition of Charles Rennie Mackintosh’s paintings and life history, which opens on certain afternoons of the week) then take a left turn which leads around the corner and down to the Place de l’Obelisque.